The more of Pluto’s surface we see, the more interesting landscapes it offers us to explore. Here’s a closer look at the landforms revealed so far, and what types of processes might have created them. This beautiful animation of hitching a ride on New Horizons as it soared over Tombaugh Regio, the massive heart of Pluto, is beautiful, but what’s the science of the landforms revealed during the close-approach flyby on July 14, 2015. In it, we got our first look at the newly-named icy mountains Norgay Montes, and bumpy plains Sputnik Planum. Now we’re going to dive into the geomorphology of how these landforms might have been created. The Norgay Montes and Sputnik Planum are in the southwest of Pluto’s Tombaugh Regio. When a geoscientist looks at a brand-new terrain, the first thing they do is look around for any landforms that look like something they might have seen before. So, what are we seeing? First, a warning: these are the initial, highly compressed images sent home by the failsafe downlinks. That means they have processing artifacts. We’ll get the lossless versions of these images later when New Horizons switches from primarily observing to primarily downloading data. All the images were captured when the New Horizons spacecraft was just 77,000 kilometers (48,000 miles) from Pluto’s surface. Features as small as 1 kilometer (0.5 miles) can be seen. When we took our first look at the geomorphology of Charon, we found plains, craters, cracks, hills, and a truly mysterious sunken mountain. While that was interesting, Pluto is getting even more attention by what it doesn’t have in its close ups: craters. The first thing that jumps out is an absence of craters, even with more of the Sputnik Planum to scour. Based on normal cratering rates, that dates the plains to being recently surfaced within the last 100 million years. For context, that’s younger than Appalachian Mountains. To be craterless, Pluto has to-be-determined active geologic processes resurfacing the world in the recent past. This is hugely unexpected. (Really: it left me flailing). A geologically active Pluto breaks our theories of activity on icy worlds. We thought the only way to get that kind of geological activity was tidal massage from a friendly neighbourhood gas giant. The closest Pluto has is Charon, its largest moon. Charon lacks the gravitational influence to jerk around Pluto’s interior enough to spur activity both because of its small size and because it is tidally locked. Being tidally locked means the two worlds always face each other as they dance around their mutual center of mass, minimizing tidal stresses. That leaves rethinking how thermodynamics apply at the dwarf planet. Pluto should be too cold to be active, but it isn’t. The best options for revising our theories are that its initial heat source lasted longer than anticipated through a yet-to-be-described process, that heat was stored, or that the heat is used more efficiently. If Pluto is made of the normal mix of silicate minerals for a rocky world in our solar system, then we’d expect that it’s radioactive elements have decayed enough to no longer be a significant heating source. It’s likely that Pluto and Charon collided in the past, the stability, circularity, and tidal equilibrium of their orbits indicate any collisions were a long time ago, so that isn’t a recent heat source either. But, there could be a loophole: the heat of impact could have created a subsurface ocean. Once a subsurface ocean forms on an icy world, it’s likely to stick around a long time due to a convenient feedback loop. Freezing increases the concentration of ammonia, a natural antifreeze that inhibits further freezing. A subsurface ocean could store a lot of heat, possibly even driving icy plate tectonics. This idea was predicted by astrophysicists Amy Barr Mlinar and Geoffrey Collins, who are hopping we find any evidence of ancient tectonic features on Pluto or Charon to support their theory of an impact-generated subsurface ocean. In the first map of frozen carbon monoxide concentration shows one very distinctive bulge in the Tombaugh Regio. This matches up with the red half splitting the heart of Pluto from the enhanced color image released last week. The concentrations increase towards the center of the contoured bull’s eye. We don’t know what this concentration means yet, nor why it’s happening only in Tombaugh Regio and no where else, but it is deeply suspicious that it’s also in a region that seems to be actively resurfacing. 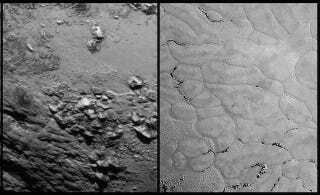 Along the boundary between the light heart of Pluto and the darker whale — now known as the Tombaugh Regio and Cthulhu Regio respectively — is a respectable mountain range. Norgay Montes are named for Tenzing Norgay, the sherpa who summited Mount Everest with Edmund Hillary in 1953. The spiked peaks jut up to 3,300 meters (11,000 feet) above the oddly-craterless plains. For context, those are mountains that are on par with the Rockies here on Earth, no rescaling necessary. This is the first exposed bedrock (or more accurately, “bed ice”) of Pluto. We haven’t definitively nailed down its composition yet, but to hold such rugged topography, it needs to be hard. The current best-guess is water ice, which at Putonian temperatures is far harder than the methane and nitrogen ice. The sprawling plains north of Norgay Montes stretch up into the center of Tombaugh Regio. Now we’re seeing them in more detail, Sputnik Planum is getting decidedly more interesting. The plains are named for Sputnik 1, the original space explorer and the first artificial satellite. Zoomed-in on oddly textured ground in Sputnik Planum. This terrain is not easy to explain. The discovery of vast, craterless, very young plains on Pluto exceeds all pre-flyby expectations. The coolest part of Sputnik Planum is easily the lack of craters indicates apparent resurfacing in the past 100 million years, the barest blink on geologic timescales. The odd pattern texturing the plains is also fascinating. Sputnik Planum is divided into irregular shapes by narrow toughs. The segments are roughly 20 kilometers (12 miles) across. Some of the troughs are traced with a darker material, while others have clumps of hills. A few of the troughs have clumps of hills. They’re probably either pushed up from below, or are somehow erosion-resistent knobs. The mission scientists have proposed two processes for creating this segments: one by cooling, the other by heating. When an area cools, thermal contraction creates roughly hexagonal segments like we see in mud cracks and columnar basalts. Alternately, these could be upwelled lumps from subsurface convection of frozen carbon monoxide, methane, and nitrogen.To me, the areas superficially resembles the patterned ground found in periglacial terrains here on Earth, but that’s not particularly helpful since how that landform is created is an ongoing geomorphological debate and it’s certainly not a freeze-thaw on Pluto. Clusters of pits etch some patches of the surface. These resemble the fields of pits formed when ice sublimates from a solid directly to an gas — see this for yourself by watching dry ice bubble into spooky fog. Elsewhere, long dark streaks stretch several kilometers (a few miles), all apparently aligned in the same direction off of larger dark regions. These may be windblown traces, produced as wind scours the surface of the icy plains. They could also be geysers, the sought-after evidence of cryovolcanism. We’ve only gotten back the tiniest bit of data from the New Horizons probe: these are the merest handful of compressed images out of the hundreds of full, lossless images still aboard the spacecraft. Because the spacecraft can only observe the dwarf planetary system or point at Earth to downlink data, the mission is currently focused on maximizing science out of the flyby. Even so, these tantalizing hints keep producing more and more enigmatic landscapes. The more we see of the surfaces of Charon and Pluto, the more geomorphic riddles we find to puzzle over. I don’t know what we’re going to see next, but I’m going to love finding out! Curious about Pluto but don’t know where to start in the deluge of New Horizons discoveries? Here’s everything we’ve learned so far! Want to see what these odd lands might look like to visit? Check out this science-inspired concept art!